I was cleaning up around my house today and saw this interesting collection of stuff. For amusement, anybody want to guess where? Canon T1i with 100 mm macro lens, on-camera flash, hand-held stack of 6 images at nominal f/11. Looks like the saw dust pile under your table saw. You've been cutting various kinds of wood and even some aluminum. Yeah, and I think we've got a clue about the origin of the metal shavings. - until you climb into his skin and walk around in it." Lee, N. H. 1960. To Kill a Mockingbird. J. B. Lippincott, New York. Hah! Dang, you folks are good! That's exactly what it is, the debris pile in one corner of my table saw. There's some white plastic in there too, but you can't really see it at web size. Betty, the aluminum chips are mostly from slabbing off the end of a 2" diameter solid rod to get stock for some adapter. No doubt the little chips from that steel whipped cream can are in there too, but so few of them that they'd be hard to find without a magnet. We're looking here into the back of the saw, where the motor mounts. In normal operation, there's a piece of plywood covering most of the back, with just slots for the motor mount and drive belt to go through. The bottom of the saw is also covered with plywood, except for one big hole in the center where a shop vacuum plugs in. 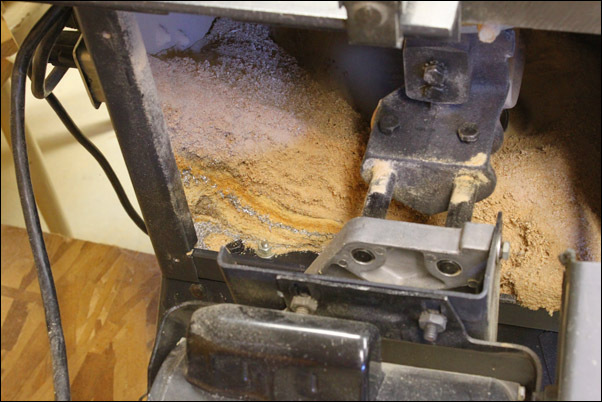 Most of the sawdust and chips get immediately sucked out the bottom by the vacuum while the saw is operating. But of course there's no air flow in the corners so whatever goes there tends to settle in place. Every once in a while I take off the back cover and clean out whatever has accumulated, using another shop vacuum with a crevice tool. Shortly after that process started was when I noticed this interesting layering and took a break to photograph it. Now that you know the whole story, I can confess that I had some artful misdirection planned for this thread. I was expecting somebody to guess "Vacuum cleaner bag? ", and then the response was going to be "Nice guess -- not quite. 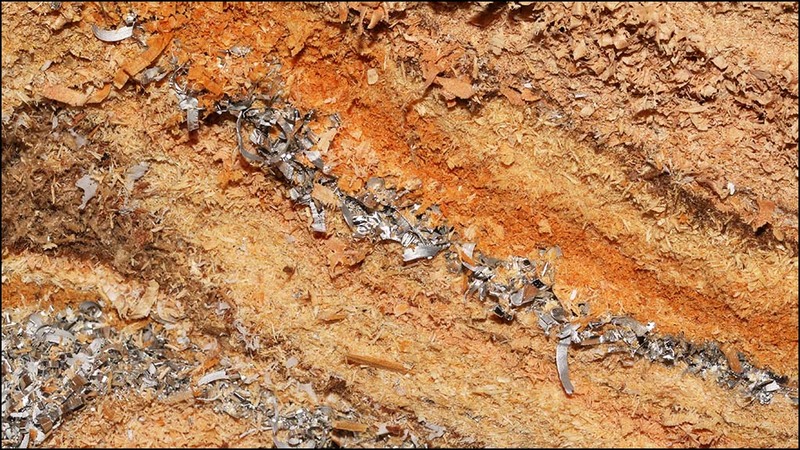 There were two vacuum cleaners involved in this formation, but the layers are not from inside either one of them. " But alas, you sharp-eyed and imaginative folks solved the puzzle before I had a chance to pull that one!